The miniature dwarves that have been a major tourist attraction in Wrocław since 2005 are a light-hearted homage to the clandestine gnomes painted in every corner of Poland in the 80s. They were the spontaneously generated symbols of the Orange Alternative (Pomarańczowa Alternatywa) – probably the most effective anti-regime movement in the former Eastern Bloc. In the second half of the 80s, the Orange Alternative did its best to get its members arrested by the Milicja Obywatelska (Civic Militia) for the most ridiculous reasons, including the distribution of free sanitary towels and a parade of cardboard tanks daubed with Duchampian slogans such as: “Watermelon in Mayonnaise.” In 1988 the Orange Alternative paid a visit to Krakow to read a pompous and corny discourse on Lenin to strikers in Nowa Huta. The founder and leader of the Orange Alternative, Waldemar ‘Major’ Fydrych, suspended the activities of his group after 1989 and relocated to Paris, where he earned a living as a painter and decorator. The coincidentally named Orange Revolution in Ukraine in 2004 spurred Major and the Orange Alternative back into action. They presented a 15-metre long orange ribbon at Independence Square in Kiev to express their solidarity with the opposition protests. 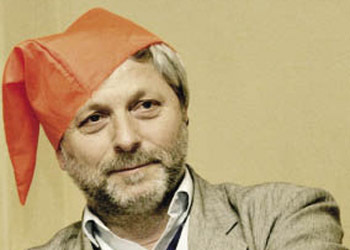 Fydrych also ran for the post of Mayor of Warsaw three times, directly challenging Lech Kaczynski in 2001, who had also adopted orange as the theme colour for his victorious campaign. Krakow Post: You are described as the ‘ideas man’ in the exhibition’s credits. What was your role? Waldemar Fydrych: I simply suggested they could arrange a show about our activity. KP: Are you proud of the outcome? WF: I would say it is satisfactorily consistent with our methods. KP: Have you kept in touch with the old guard of the movement? WF: We catch up with each other periodically. KP: What, in your opinion, has been the best Orange Alternative performance to date? WF: A long time ago in the 80s we had fun painting dwarfs on the blotches obscuring anti-regime slogans. KP: Did you ever notice any expressions of complicity or solidarity from militiamen during your happenings? WF: All former ZOMO officers obviously voted for me following the abolition of their organisation in 1989. KP: Tell us about your stay in Paris immediately after the fall of Communism? WF: It was a very useful move in my life. I wrote three books there. I definitely adore Paris. KP: Why did you recently decide to sue the city of Wrocław for plagiarism? WF: They stole the dwarf-shaped pattern I created and used it as a city logo. KP: President Lukashenko is doing his best to suffocate flash mobs in Belarus. Do you think that impersonal forms of protest can ever be effective? WF: I believe that open protest is the only way to challenge power. KP: What is your opinion of the ‘happening’ scene in Poland post-1989, especially with regard to groups such as Wspólnota Leeeżeć and Piotr Wyrzykowski’s C.U.K.T? WF: Wspólnota Leeeżeć has been lazy recently. This is the first time I have heard of C.U.K.T. KP: Did you decide to support the Orange Revolution in Ukraine because of their chromatic affinity with your movement? WF: That was not a matter of colour, but of justice and freedom. KP: Why did you suddenly decide to pursue a political career? WF: I would say rather that it was politics that pursued me. KP: Will you retire from politics following your attempt last year to become Mayor of Warsaw? KP: Do you think that your dwarfs appeal to a generation raised on Pikachu and SpongeBob SquarePants? WF: I am optimistic in this regard.